Regardless of whether it was right or wrong to tamper with The Doors’ original recordings while restoring them for the boxed set Perception, there’s no getting around the fact that the alterations that were made have forced a complete and total reevaluation of the band’s canon. Some outings, such as The Doors’ self-titled debut, hold an iconic place in the hearts and minds of many, but when viewed with fresh ears, they don’t hold up nearly as well as one might imagine — even if they did serve their purpose quite well. On the other hand, there are some endeavors that frequently and unnecessarily have been overlooked and overshadowed. Such is the case with The Doors’ sophomore effort Strange Days. Although it may have lacked a single that was as well-honed as Light My Fire — or Break on Through (to the Other Side), for that matter — it was a better album. In fact, it arguably is the finest and most realized set of material that the ensemble ever concocted. 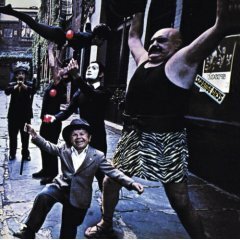 Strange Days benefits immensely from the revisionist history of its new presentation, more so than any of The Doors’ other efforts. Unlike the restoration of the previously censored bits of The Doors’ self-titled debut, the adjustments that were made to Strange Days actually have improved the endeavor. Released in late 1967, just nine months after the group launched its opening salvo, the outing was a bold step forward, one that not only embraced the psychedelicized sounds of the era but also shoved them down a far darker, more demented path. In the liner notes to the recent reissue of the affair, engineer Bruce Botnick outlines how he had scored a pre-release, monaural acetate of The Beatles’ Sgt. Pepper’s Lonely Hearts Club Band, and he tells how it had liberated The Doors to experiment in the studio. There always has been a spooky deliriousness to Strange Days, but the crisp, clarity of its new mix gives the collection’s contents considerably more room to unfurl their lysergic tentacles. Most of all, the interplay among The Doors’ members is highlighted magnificently, and the worlds that are conjured oscillate, at the flip of a switch, between being strikingly beautiful (You’re Lost Little Girl) and chillingly horrific (Horse Latitudes). Better than ever before, Strange Days’ swirling music meshes with Jim Morrison’s twisted wordplay, and taken in full, it presciently outlines the demise of the happy-go-lucky hippie culture that was thriving just a few hundred miles north along the California coastline. "Strange days have found us/Strange days have tracked us down/They’re goin’ to destroy our casual joys/We shall go on playing or find a new town," Morrison croons moodily on the title track, thus setting the stage for the volatile rebellion, the disorienting atmospheres, and the lost and lonely ruminations that fill the remainder of the endeavor. There’s a seductive, comforting quality to the manner in which he sings I Can’t See Your Face in My Mind and Moonlight Drive, but the fates toward which he is leading are lecherous, foreboding, and sinister. Strange Days concludes in the only fashion that it possibly could — with the explosive, apocalyptic fervor of When the Music’s Over, a politically-charged epic that merged Light My Fire with The End while pushing one generation to confront and challenge another. The bonus tracks featured on the new rendition of the outing don’t amount to much — a bunch of pointless studio chatter and false starts that were taken from a session that produced People Are Strange and a slightly rougher rendition of Love Me Two Times — but then again, an album like Strange Days doesn’t need to be bolstered by extras. It is, at once, everything that The Doors wanted to create but never again were able to achieve.